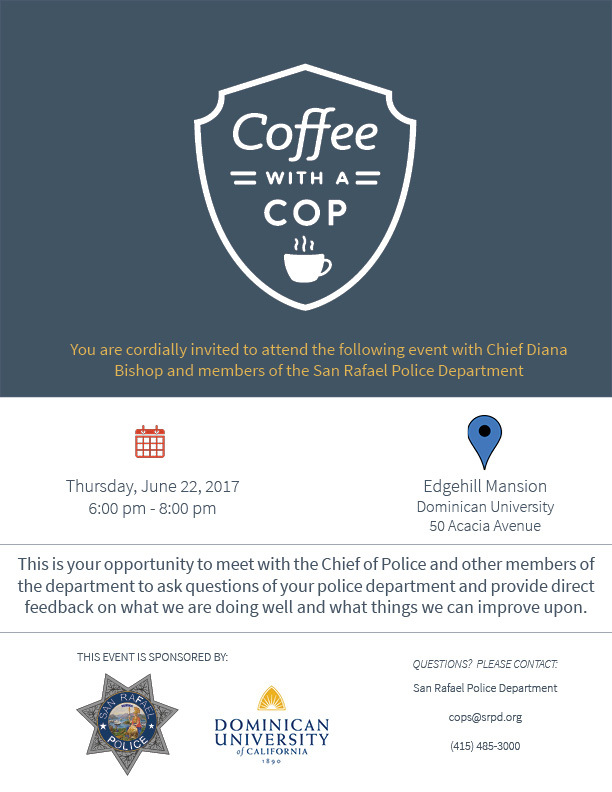 Join neighbors, Police Chief Diana Bishop, and members of your San Rafael Police Department for coffee and conversation on Thursday, June 22 between 6 and 8 p.m. in the Edgehill Mansion Garden Room on the Dominican University Campus. There are no speeches, no agenda, just coffee and conversation. This event provides an opportunity for residents to ask questions, voice concerns and meet the men and women who protect and serve you every day. All are welcome; there is no need to RSVP. Parking is available below the Edgehill Mansion off Magnolia Avenue.